"This is an adaptation of a recipe I found that has been changed to make it a little quicker and easier. It tastes just like the sauce served on the fried bratwurst at my favorite local German restaurant. Use hot curry powder if you like it a bit spicier or add some cayenne for a kick." Combine tomato sauce, cider vinegar, curry powder, paprika, sugar, cayenne pepper, salt, and pepper together in a saucepan over medium heat; cook, stirring occasionally, until sauce is warmed and smooth, 5 to 10 minutes. This is best served with bratwurst sliced and then pan fried. 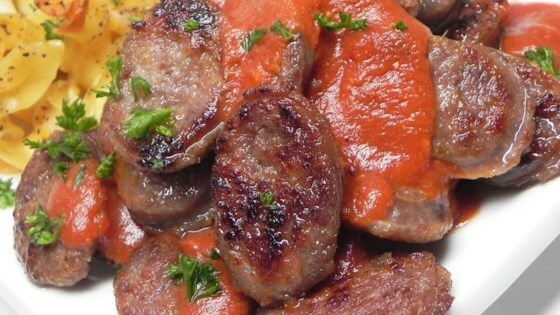 Pour the sauce over the cooked sausage slices. This is also good with cocktail wieners served in a slow cooker and left on warm. Needed a lot more amping up in terms of flavor.